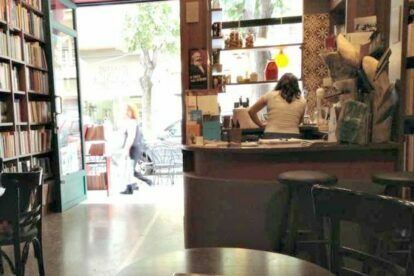 When walking along Alexandrou Svolou Str., this little bookstore-coffee shop will definitely catch your eye. The reddish outside and its well-arranged window display makes it hard not to look inside. On entering, you will first notice the floor-to-ceiling bookcases and the picturesque tiled kitchenette, stuffed with tea tins, cups and coffee pots. The indoors is piled-high with books and arrayed with some quaint inviting tables. The ambience is perfectly complemented with jazz music and the aroma of coffee and books. In warm days, a few tables are laid outside, on a cool and shady pavement. Students and scholars are among its regulars, helped by its proximity to the university campus. With so many sources of information and the possibility of a hot cup, banned in any library that I know of in the city, I can’t imagine a better place for studying or doing paperwork. As for the history, the spot derives its name from the trilogy written by Stratis Tsirkas, translated as Ungoverned Cities, which focused on the state of affairs in three ungoverned cities, namely Jerusalem, Cairo and Alexandria, during World War II. The name fits the philosophy of the bookstore, since it functions on a cooperative basis, which also allows to deal with the crisis’ difficulties that immensely affects the field of books. Besides selling books, they also hosts events about books, politics, art and culture. So, if you’re looking for the nicest spot to read your book, now you know.